Crumbled nutty graham crackers, a layer of thick, dark creamy avocado pudding, more shards of grahams, a dollop of fluffy vanilla scented marshmallow fluff burnt to gooey shades of golden caramel in the broiler. Topped with broken melty squares of chocolate. If you read my last post you’ll recognize the no-cook avocado pudding recipe from my Tropical Delight Smoothie Bowls. Dig right in! 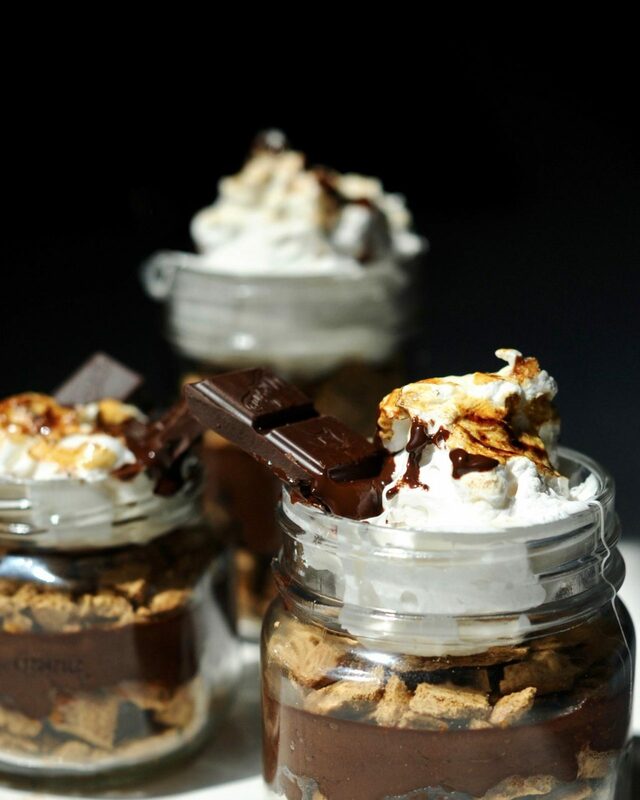 Or cap your jars and hand out portioned S’mores in a jar at the picnic. If I still had school aged kids I would place one of these in their lunch box on the first day of school. This recipe was born from necessity and my obsession with little jars. The plan was for good old fashioned find-a-stick and roast your marshmallows over the fire S’mores but when I got my box of graham crackers home from the market I found that almost all of them were broken. No use crying over broken cookies. 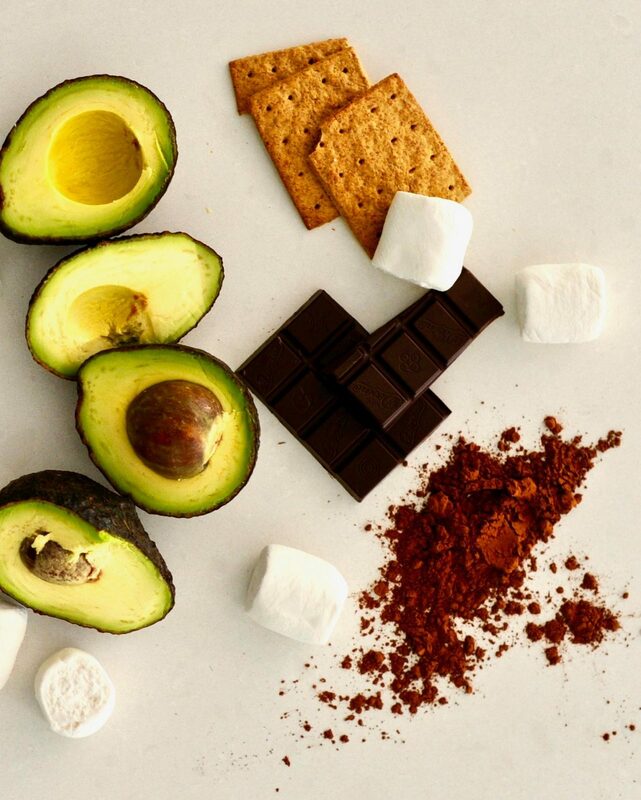 These little treats are by their very nature More-ish, actually they are S’more-ish. 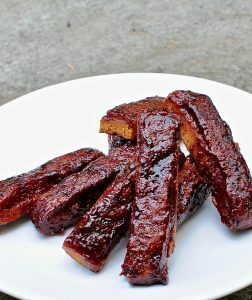 I’m throwing a cook out next week, along side these S’more Jars I’m serving my Bbq Seitan Ribs in Sticky Tamarind glaze. 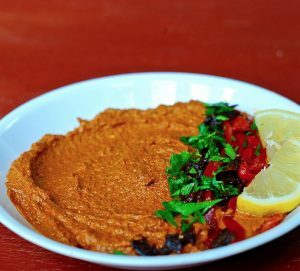 Smokey Red Pepper Muhammara dip. 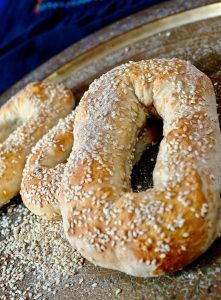 Smeared on Old City Jerusalem Bread. 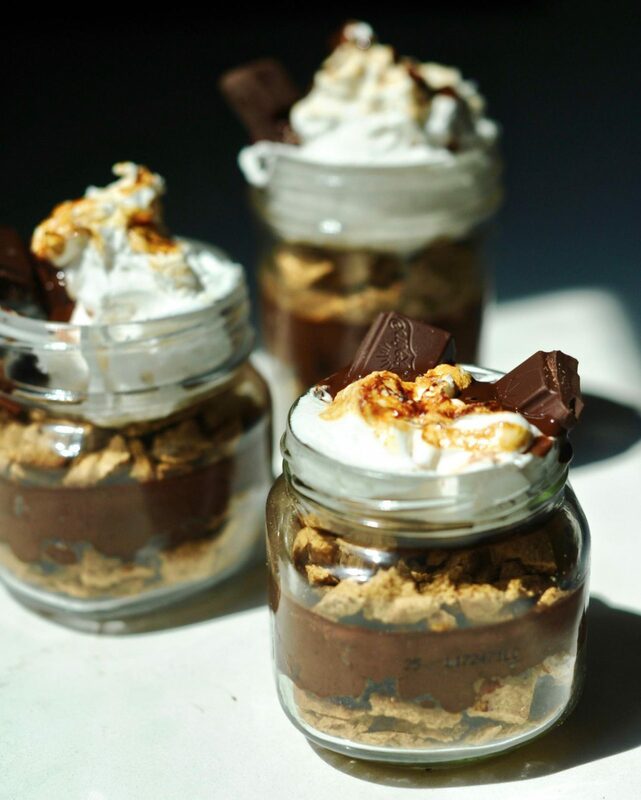 Almost healthy, portable S'more jars for your next picnic or cook out. 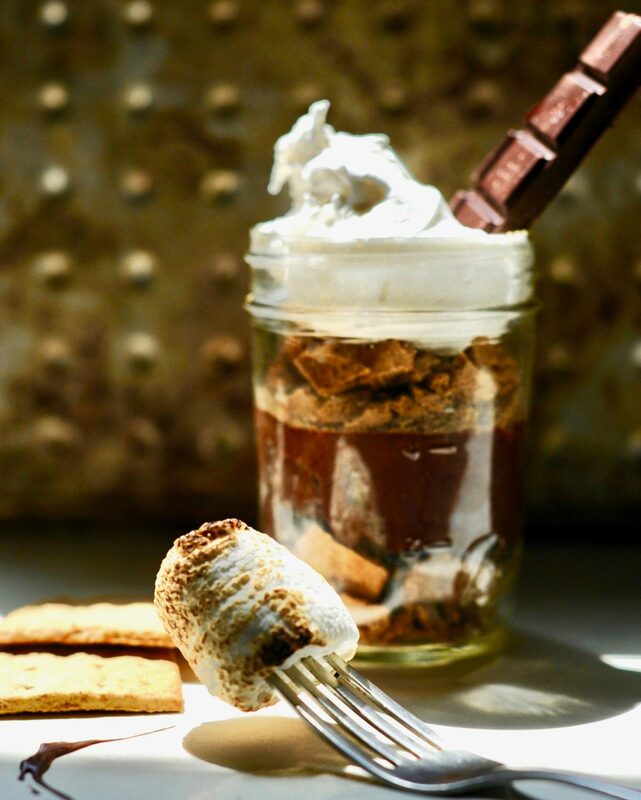 Layers of creamy dark chocolate avocado pudding, crumbled graham crackers, and brûléed marshmallow cream. A more-ish make ahead treat. Marshmallow Fluff (you can skip this step and use marshmallows) This will make more then you need, perhaps make meringues with the rest. I over-filled my jars for the photographs but if you are capping and transporting your jars to a picnic then show some restrain in filling them. Lol. Blend all of the pudding ingredients together thinning with between 5-6 tbsp of non-dairy milk to get your desired consistency. Crumble your graham crackers into medium bits. I like a mixture of larger and smaller crumbs. * I prefer the texture of Marshmallow Fluff (whipped aquafaba) to marshmallows. 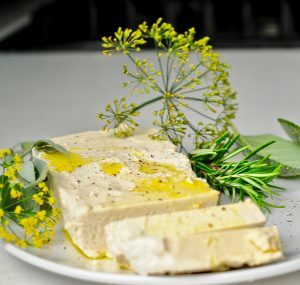 If making and eating the recipe within a couple hours then you can skip the Xanthum gum and use cream of tartar in the Aquafaba recipe. 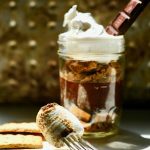 If the S'mores jars are for much later or even the next day then use the Xanthum gum. The Xanthum gum will help keep the marshmallow fluff stable and not weepy. Or skip the aquafaba and just use boughten marshmallows. Slowly add the sugar 1 tablespoon at a time while still whipping. Make sure the sugar is completely incorporated and there you have a lovely marshmallowy texture. Keep whipping until you have stiff peaks. Take your four small clean jars and layer a couple of tbsp of graham cracker crumbs in the bottom of each. Now carefully (why did I write carefully?) spoon the avocado chocolate pudding between the jars. Top with another layer of graham cracker crumbles and the top with either a couple of marshmallows or aquafaba whip. Brûlée them with a torch if you are lucky enough To have one or turn the broiler (grille for Brits) in your oven to high and lightly brown the tops (about 2-3 minutes). 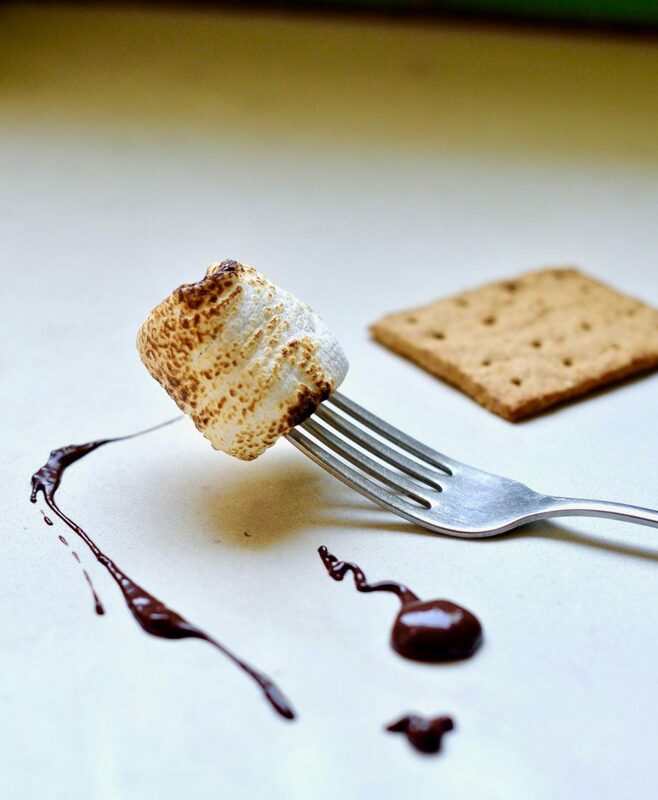 When ready to serve then plunk a few squares of chocolate into the marshmallow fluff. 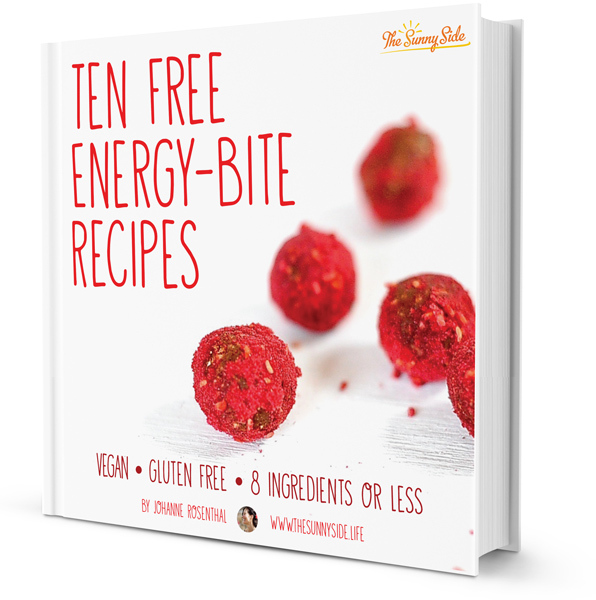 Hanne, these look fabulous! You have inspired me to make something else with cookies, marshmallow fluff and chocolate! 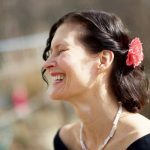 Alison,the Brownie Queen, I am honored! Cookies, Marshmallow, fluff and chocolate. What a combo. They all disappeared so fast! I need to make more! Wow is what comes to mind. Wow. Wow. WOW!! For me personally? I love my marshmallows ON FIRE! I mean, I don’t eat them on fire, I just like to light them on fire and then eat that burnt crust with all that sweet goodness in the middle. Your pudding looks amazing! Oh my gosh I can totally relate. It is hard to make myself put them out once they are flaming. Ha ha.